Four-percent of the Bay Area population uses a bike to commute to and from work-a statistic that is unmatched anywhere else in the country. The large population of bicyclists and motor vehicles results in a great deal of tension that complicates the interpretation of bicycle and motor-vehicle accidents. In March 2012, San Franciscan bicyclist Chris Bucchere was riding his bike southbound on Divisadero toward Market when he struck and killed Sutchi Hui, a 71-year-old pedestrianwho was crossing the street. The thirty-second traffic video shows that cars had stopped in response to the ending yellow, prompting a few pedestrians to start walking early before the light turned red. Then, at about 25-30 mi/hr, Bucchere is seen riding, through the intersection in the last few seconds of the yellow, and as he mentions in a blog post, the crosswalk was filled “almost instantly”, and he had to “plow through the least populated” side he could find ultimately colliding with Hui, killing him. There are many factors that contribute to the difficulty of assigning fault in this situation. First, the fact that the pedestrians began walking early may have contributed to the difficulty Bucchere had in readjusting his trajectory to avoid them. On the other hand, Bucchere was riding between 25 and 30 mi/hr through an intersection when all other vehicles had stopped for the imminent red. In addition, Bucchere had reportedly sped past two red lights just before the intersection in question. Together, the pedestrians walking early combined with Bucchere’s speed created a difficult situation to get out of unscathed. The pedestrians who walked early and Bucchere were being too aggressive amidst the rush hour pressure, expecting the other parties to behave in a way that accommodated the other’s intentions. Unfortunately, those expectations collided, resulting in the death of Hui. The combination of this ambiguity and the fact that the light had not completely turned red made it difficult to eventually convict Bucchere with gross negligence leading to felony vehicular manslaughter, a sentence that carries two to six years in prison. Bucchere is the first bicyclist to be thus convicted, although he was not given the full brunt of the corresponding sentence. Instead of prison time, Bucchere was sentenced to three years of probation and one-thousand hours of community service. In response to the accident, there has been a great deal of disagreement towards the sentencing of Bucchere. Many believe that it was not a harsh enough sentence given that the accident resulted in the death of a person. One anonymous commentator writes that “cyclists are lazy entitled jerks”, while still others argue that a driver of a motor vehicle would have faced a more severe recourse than Bucherre. While speculative and unsubstantiated, these conversations reflect a tension on the road between motor vehicles and bicyclists that has been seen in various forms, from internet comments to road rage. Both cyclists and drivers can be negligent-the problem is that sometimes, the difference in the size of the bike and motor vehicle makes it difficult to get rid of observer’s bias as to who is more reckless or negligent. It is important to consider how such biases may affect juries. In a recent case in Boston, there has been a great deal of upset regarding the verdict in a case where a bicyclist was fatally injured by a truck. Despite the fact that there was video footage, and several eye witness testimony insisting that the vehicle that struck him was going too fast, the driver was not charged. The jury’s indictment was seen by many cyclists in the area as a sign that their rights are not equated with those of motor vehicles. However, in examining criminal cases, it is important to keep in mind that the burden of proof in a criminal case is significantly higher than that of a civil matter. In the former, one is innocent unless proven guilty beyond a reasonable doubt, whereas in the latter, a case is won and lost based upon whether or not a claim can be reasonably affirmed. Of course, being accident-free is the optimal state of affairs for any driver or bicyclist. To get as close as possible to that standard, it is essential to practice appropriate safety measures to prevent avoidable accidents. For all participants on the road-bicyclists, pedestrians and cars-observing the road with a careful eye, and being considerate of others’ needs are key to sharing the road effectively. For cars and bicyclists, wearing appropriate safety gear such as seatbelts and helmets respectively can help avoid potentially severe injuries. But accidents do happen, and when they occur, it is important to be proactive in acquiring the facts of the incident. What is done at the scene of the accident is crucial—bicyclists and motor vehicle drivers must collect the raw data at the scene, and exchange contact information. While collecting basic information, it is also important to examine liability issues, namely who may or may not have been following the traffic laws. If there have been injuries, it is important to have a medical professional assess the extent of that injury, and verify whether there is a possible link between the accident and the observed injury. In many jurisdictions, it is not necessarily the case that not wearing a bicycling helmet or a seat belt contributes to negligence, although this is not an entirely clear cut rule. In assessing these issues, it is useful to speak with a legal professional. 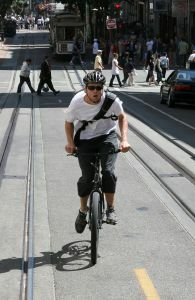 Attorney Greg Brod at the Brod Law Firm serves the Bay Area and Northern California has extensive experience in representing injured bicyclists and motorists. If you, or someone you know has been involved in an accident, contact the Brod Law Firm for a free consultation to get on track with your case.